Shocked!! Yes, another post. Well, today is quite a dreary, rainy day. I decided to brighten by day working with bright, cheery fabrics. 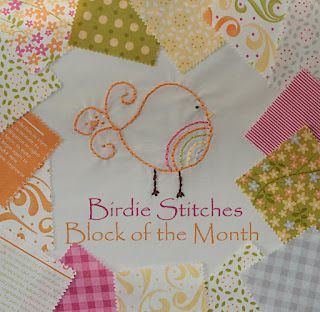 I am following the lead of Tanesha, "CraftyGardenMom" and plunging into the LMS BOM-Birdie Stitches. Here is a pic of my background. The background didn't quite turn out like I had planned. Now, yes, it does work and I like the final results, however, it wasn't planned this way. I hoped to have solids in each corner to have a distinctive solid 4-patch. Now I have 4-patch blocks in random areas! I will be using #8 Pearl Cotton, more than likely in a purple for most of the embroidery parts, sprinkle in accent colors here and there. Keep checking back to see my progress. I received by quilt back from having it quilted. The quilting was done at the Missouri Star Quilt Co. It is a pantograph design. It was completed in less than 3 weeks. The only thing left to do now is binding! Not a big fan of binding. I will try my hand at machine, but will practice first before tackling the quit top I would highly recommend them if you need a quilt quilted. BTW, my quilt was featured on their blog August 2nd. How do you spell relief??? "ROLAIDS"! Work is truely getting to me. Two more weeks and things should return to semi-normal. I won't be torn between three facilities. To work through some of this I have started "art" journalling, sorta. :-) I am not artist, but I can doodle, color, cut and paste. Here's a couple of pics. My retreat to childhood...no worries no stress. This is my book of doodles, paint, and coloring. I had forgotten how much fun coloring and painting was!! My other stress relievers are listening to my fav podcasts. 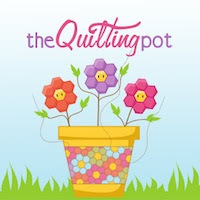 I just caught up on Tanesha's podcast-Craftygardenmom". She talked about her "Birdie Stitches" blocks. After seeing how cute they were, I searched her past posts to find out who's BOM it was. Yay! I was successful. The BOM pattern was from "Little Miss Shabby" blog. How cute. I have printed out the first three blocks. I hope to start soon.